The most powerful environment for treating the human condition is the home. The home setting provides strength for the most vital aspect of the healing process: the human spirit. An environment of familiarity promotes a positive state of mind, creating a greater sense of self by enabling the highest degree of functionality and privacy possible. 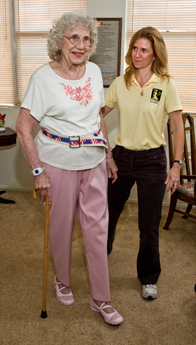 Hygeia Home Health services are the answer for all your rehabilitative and extended care needs. Hygeia is dedicated to providing the highest quality comprehensive home health services to its patients, with the goal of ensuring that performance consistently exceeds the expectations of patients and referring physicians. An innovator in designing its services to recognize the acute needs of patients, Hygeia sets the pace for innovation in the home health care industry by offering a variety of specialty disease management and community services. Hygeia employs a full time in-house staff of registered nurses, physical, occupational and speech therapists to meet all your home health care needs. These clinicians use an encouraging approach to therapies, driving incremental progression towards patient centered goals. Care programs are customized with written exercise plans that are specific to patients’ individual pathologies and problems. Unlike most home health agencies, Hygeia is 100% Clinician owned. Hygeia clinicians are recognized for their excellence in nursing care, utilizing comprehensive medication and disease process education, mental health nursing and social work. Our professional staff is dedicated to helping patients achieve the peak quality of life possible. We are not satisfied until we have addressed every possible concern to its fullest, giving you confidence that comes from an independent lifestyle. Are you eligible for Hygeia Home Health services? Hygeia serves qualified Medicare beneficiaries that are home-bound because of a recent hospitalization or illness, need intensive skilled nursing care, or suffer from a medical condition that requires periodic or regular assistance from a professional caregiver. If you are unsure about whether you qualify for Hygeia Home Health services, we encourage you to contact your physician or call us directly at 727.343.6462.